← What doesn’t kill you makes you stronger: Galapagos reef recovery. The National Oceanic and Atmospheric Administration (NOAA) recently announced that the longest global coral bleaching event on record is going to get even longer . For the past 21 months, tropical waters throughout the globe have experienced above average temperatures that cause coral disease, stress, and bleaching . The current global coral bleaching event – the third in recorded history – is being fueled by global warming and an unusually intense El Niño . This longer than expected event is predicted to keep going into 2017. Extending the current, stressful oceanic conditions could prove disastrous for corals in the Caribbean and, more specifically, the Florida Keys. As I mentioned last post, the entire Caribbean area was expected to be hit by the global bleaching event. In accordance with this prediction, the Florida Keys hit critically high temperatures in August – September of 2015 and experienced bleaching . Bleaching in the Keys area has not only reduced overall coral coverage, but changed the species composition. Changing species compositions come from the fact that some species are more strongly affected than others by extreme abiotic conditions such as temperature, aragonite composition, nutrients, and salinity. 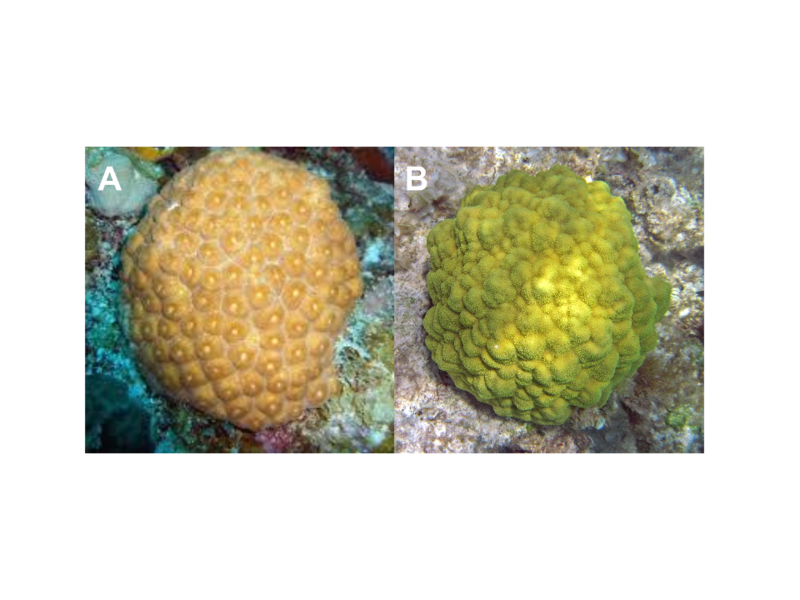 For example, Montastraea cavernosa (Figure 1a) and Porites astreoides (Figure 1b), two common coral species in the Florida Keys, are more stress and heat tolerant than other genera like Acropora and Orbicella . Additionally, M. cavernosa is more resistant to extreme high temperatures whereas P. astreoides is more resistant to extreme low temperatures. These thermally resistant species have mitigated the overall loss of coral caused by large temperature changes. Figure 1. 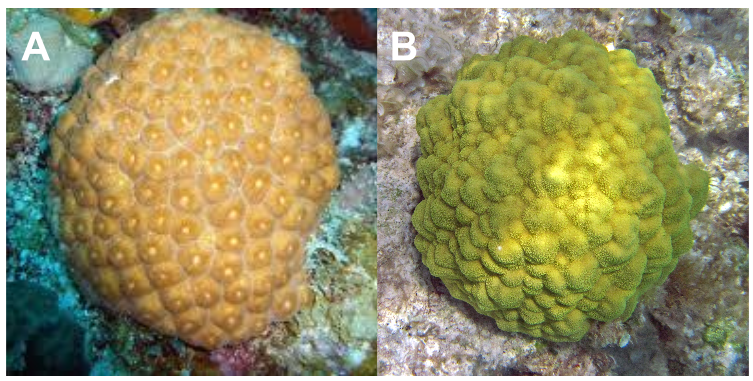 Two species of coral that are common in the Florida Keys, (a) Montastraea cavernosa, and (b) Porites astreoides. Interestingly, inshore patch reefs also showed more resistance to high temperatures than offshore reefs. Despite experiencing the same heat stress, inshore reefs were less inhibited in terms of growth. The researchers who found these results suggest that sustained growth is either a result of inshore corals’ capacity for acclimatization/adaptation or stimulated growth from elevated nutrients and/or high aragonite composition . In either case, inshore corals have also been able to mitigate the harmful effects of high temperatures. Figure 2. Current stress levels of the Florida Keys area . Despite these factors that have contributed to lessened damage, corals in the Florida Keys still experienced widespread bleaching through 2014 and 2015 . In order for the coral reefs to survive, recovery from bleaching is critical. As of now, temperatures in the Florida Keys have returned to average (Figure 2) . However, if El Niño is prolonged as predicted, the Florida Keys could soon undergo another bleaching event (Figure 3) . This time, it could be largely fatal. Figure 3. Predicted thermal stress levels for June to August, 2016 . “El Niño Prolongs Longest Global Coral Bleaching Event.” AGU. American Geophysical Union, 23 Feb. 2016. Web. 17 March 2016. “El Niño and the 2014-2016 Global Coral Bleaching Event.” NOAA Satellite and Information Service. National Oceanic and Atmospheric Administration, 2015. Web. 17 March 2016. Aronson, Richard, and William Precht. “White-band Disease and the Changing Face of Caribbean Coral Reefs.” Hydrobiologia 460.1 (2001): 25-38. Web. 17 March 2016. Manzello, Derek et al. “Coral Growth Patterns of Montastraea cavernosa and Porites astreoides in the Florida Keys: The importance of thermal stress and inimical waters.” Journal of Experimental Marine Biology and Ecology 471 (2015): 198-207. Web. 17 March 2016. 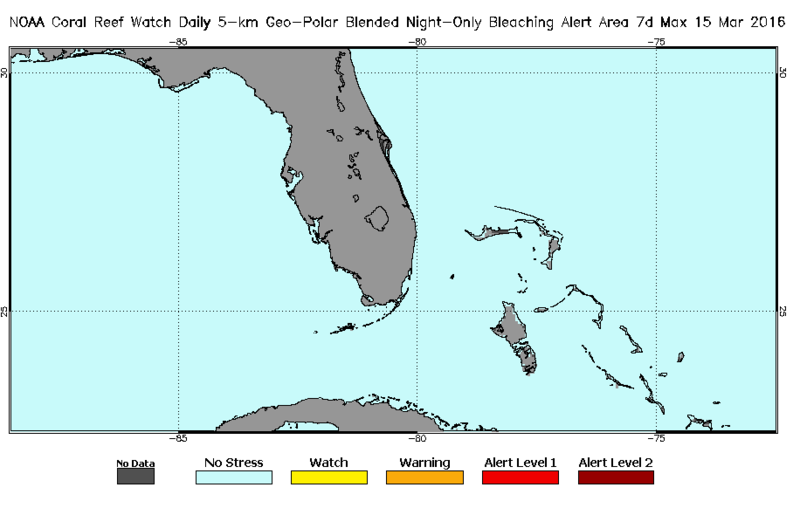 “Florida Keys: 5-km Bleaching Thermal Stress Gauge.” NOAA Satellite and Information Service. National Oceanic and Atmospheric Administration, 2016. Web. 17 March 2016. Eakin, Mark C. “2016 Outlook on Coral Bleaching: El Niño, the guest overstaying his welcome.” NOAA Coral Reef Watch, National Oceanic and Atmospheric Administration, 2016. Web. 17 March 2016. This entry was posted in Uncategorized and tagged 2016, bleaching, coral, Florida Keys, Marie, recovery. Bookmark the permalink.